Oral Implantology is the area of Dentistry that deals with the replacement of one or more missing teeth with the use of dental implants. 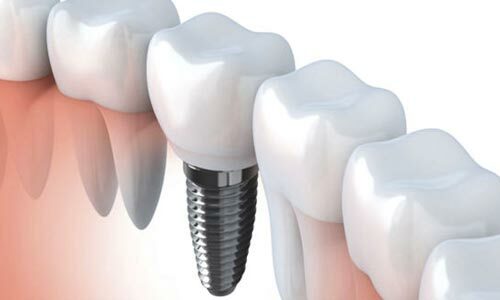 Dental implants are root form titanium screws which during a simple surgical procedure are placed in the jaw bone and serve as the base onto which a crown or a bridge is fitted. Dental implants is the most advanced way we have today to give you back your natural teeth and smile. Today with the use of dental implants, a patient who is missing one or more teeth can in a matter of hours have his/hers teeth back. This technology is called as immediate implantation and immediate loading of dental implants. It is also known as teeth in a day or same day teeth. With the use of dental implants today patients can have fixed teeth back which feel very natural and secure as opposed to wearing removable dentures. This allows them to smile again with confidence and eat with even more efficiency.